Home » Health News » Depression During and After Pregnancy Can Be Prevented, National Panel Says. Here’s How. As many as one in seven women experience depression during pregnancy, or in the year after giving birth, and there has never been any method scientifically recommended to prevent it. On Tuesday a government panel of health experts reported that it had found one method that works. Some kinds of counseling can ward off perinatal depression, the panel said, and it urged it for women with certain risk factors. The guidelines marked the first time a national health organization has recommended anything to fend off the most common complication of pregnancy, and they amounted to a public call for health providers to seek out at-risk women and guide them to treatment. The panel, the United States Preventive Services Task Force, gave its recommendation, published in the journal JAMA, a “B” rating, meaning that under the Affordable Care Act, counseling should be covered without co-payments for women. “We really need to find these women before they get depressed,” said Karina Davidson, a task force member and senior vice president for research for Northwell Health. Perinatal depression, as it is called, is estimated to affect between 180,000 and 800,000 American mothers each year and up to 13 percent of women worldwide. Its consequences can be serious for both mothers and their babies. Perinatal depression increases a woman’s risk of becoming suicidal or harming her infant, the panel reported. It also increases the likelihood that babies will be born premature or have low birth weight, and can impair a mother’s ability to bond with or care for her child. The panel reported that children of mothers who had perinatal depression have more behavior problems, cognitive difficulties and mental illness. The panel of independent experts, appointed by the Department of Health and Human Services, evaluated research on numerous possible prevention methods, including physical activity, education, infant sleep advice, yoga, expressive writing, omega-3 fatty acids and antidepressants. Several showed some promise, including physical activity and programs in Britain and the Netherlands involving home visits by midwives or other providers. But only counseling demonstrated enough scientific evidence of benefit. Women receiving one of two forms of counseling were 39 percent less likely than those who didn’t to develop perinatal depression. One approach involved cognitive behavioral therapy, helping women navigate their feelings and expectations to create healthy, supportive environments for their children. The other involved interpersonal therapy, including coping skills and role-playing exercises to help manage stress and relationship conflicts. So far, women in Rhode Island, Mississippi and Japan have participated, said ROSE’s creator, Caron Zlotnick, a professor of psychiatry and human behavior at Brown University. She and Dr. Johnson are testing its expansion to 90 clinics throughout the country. “We’re trying to buffer people and prepare them for things that are really difficult,” Dr. Johnson said. Karla Manica, 30, a single mother of four in Detroit, participated in “Mothers and Babies” when pregnant with her youngest, who is now 1. She said she experienced abuse as a child and in relationships, attempted suicide by drinking cleaner, lived in homeless shelters after being laid off from her job as a dementia caregiver, and has had bipolar depression. Experts and leaders of the programs, whose curriculums and counselor training are free, said financial and other obstacles exist. “Cost is definitely still an issue,” said Dr. Tandon. He said one prenatal session costs clinics delivering the counseling $40 to $50 to provide mothers’ transportation and child care, and Medicaid doesn’t have a reimbursement code for preventive counseling, so clinics often absorb the cost of staff time to provide it. Access to counseling also can be difficult. “Especially when you’re pregnant and you have competing demands on your time and energy, or if you have a little one at home,” said Dr. Felder, who wrote an editorial about the recommendation. Offering it online or through apps may help. Captoria Porter, 28, of Bolingbrook, Ill., who has seven children, ages 2 months to 11, experienced no depression during or after her first five pregnancies. But during her sixth, life became more tumultuous, with marital problems and the need to move in with her sister because the housing project where she was living was closing. That warded off full-blown depression. “I caught it early,” she said. The panel noted there is currently no screening tool to identify women at risk and urged experts to develop one. Research on genetic underpinnings of the condition may eventually help with screening. The panel encouraged more research on all prevention approaches. In reviewing 50 studies of various methods, it found negative effects only in the two small studies with antidepressants. One study reported instances of dizziness and drowsiness among women who took Zoloft. The other reported that more women taking Pamelor experienced constipation. 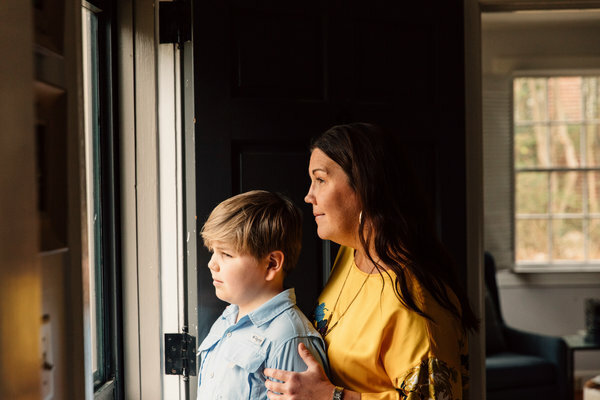 Beth Sanfratel, 43, a preschool teacher in Birmingham, Ala., said she wished she’d had a counseling program when pregnant with the second of three sons, Mac, now 10. Ultimately, Ms. Sanfratel, a former social worker, recognized she needed help and took antidepressants for about a year, resuming them shortly before her third son, Beau, was born in 2011. “Getting moms figuring out what’s going on ahead of the actual delivery, it’s a great, great thing,” she said. « Alzheimer’s: How do tau tangles grow?